The Graco Electric Dyna-Star pump from MotionSource is an electric pump for heavy duty automatic lubrication and transfer systems. The Dyna-Star HP and HF 24VDC Electric Lubrication Pumps compliments Graco’s Dyna-Star 10:1 Hydraulic and Fire-Ball 300 50:1 Pneumatic pump offering. Now you have three power source options for automatic lubrication systems and transfer applications. The field-proven Graco Electric Dyna-Star pump delivers on expectations for reliable, automatic grease dispensing, even in the harshest environments demanded by off-road mobile applications. The pump is equipped with a 6-pin (4 pins are used), M23 connector for use with Graco cable wiring harness kits 77X545 and 77X546. The Electric Dyna-Star pump is a field proven pump that offers a quick ROI. MotionSource is also your authorized Graco warranty repair center. Why not have one of our Graco trained technicians evaluate your pump before you buy new. If your pump is within warranty, we’ll fix it free! If not, we’ll let you know your cost to repair. It’s as easy as calling us at 888-963-6686. 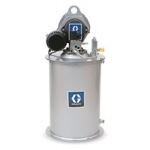 When you work with MotionSource you’re working with the premier Graco pump source!